The Iceman has wound its way through the festival circuit to emerge into a medium-sized release. It’s a path I found surprising because except for some stylish period production design, the movie seems like a red-meat macho serial-killer movie. 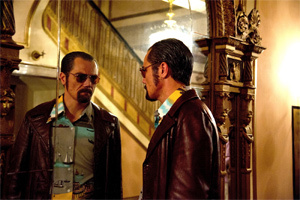 Michael Shannon anchors The Iceman as an ambitious, relentless hustler named Richard Kuklinski. He has his start in a film lab “Dubbing cartoons” — that’s what he tells his wife-to-be Deborah (Winona Ryder, trying a little too hard to get into character) what he does. It’s a euphemism for copying pornographic movies. When the mafia comes calling in the form of Ray Liotta’s Roy Demeo, Kuklinski catches their eye as a possible asset. Kuklinski proves himself a man willing and able to kill. Kuklinski is a good hit man. But as the straightforward ’70s turn into to the complex ’80s, Roy and his gang have to lay low. Kuklinski gets bored, and trough various connections he eventually contracts out to the Cali cartel. I’ve grossly oversimplified, but that’s about all the enthusiasm I can work up for The Iceman. I might have liked the film better if it had been more at home in the art house theaters. Shannon has a magnetic face, and his explosive temper under an icy-calm exterior makes for an interesting character study. But as it is, the movie explains his violent temper by showing a troubled upbringing. A side plot with his brother likewise feels unnecessary. That stylish production design is very good, but there is occasionally some “off” detail that makes the whole thing look like an impressive replica, rather than the real thing. Is it the parking lines painted on the streets? Are the cars and clothes too clean? I’m not sure which element felt wrong, but it called attention to itself in a way that distracted from the characters. The Iceman is not all bad. In addition to Shannon’s fascinating performance, there are some good scenes, especially later in the film when Kuklinski meets another killer while looking for work. In the film’s best scene, they talk shop. But if it were marketed through the mainstream channels, rather than the festival and art-house circuit, I think The Iceman would get the cold shoulder it deserves.